Even international observers consider Tajikistan to be a failed state in the midst of a national crisis. There is a growing mood of protest, which benefits the Islamic opposition. Some 364 new mosques have been opened since the beginning of the year, and in Dushanbe more and more women are seen wearing veils in public. 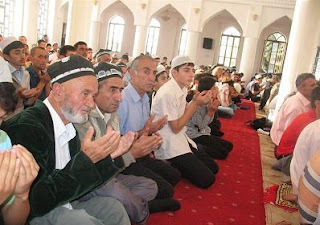 Tajikistan's authoritarian leader has approved a law barring minors from praying in mosques as his secular government seeks to minimize the rising influence of Islam in the Central Asian nation. A total cost of the project is 100 million U.S. dollars. 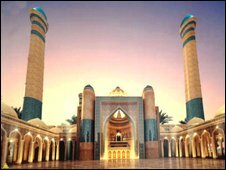 The Persian Gulf kingdom of Qatar is putting up 70 percent of the cost of the project, with Tajikistan raising the rest. “They do this act of charity in order to build up a positive image in the country which may favorably place Qatar when it comes to future investments,” said David Roberts, deputy director of the Qatar branch of the Royal United Services Institute, a security think-tank. We have to take this with a grain of salt, as always when the Mega Corporate Foundations and their media outlets are involved and even more so when they quote Qatar-based Think Tankers. For this reason it is advisable to question the ulterior motives of Sheikh Hamad bin Khalifa al-Thani and his minions. 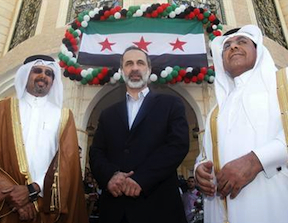 Qatar, the paragon of democracy, is among other things currently arming and financing the 'rebels' in Syria and, as Pepe Escobar explains, this is not about promoting democracy but about Pipelineistan. The Kyrgyz State Commission on Religious Affairs is verifying the alleged involvement of certain mosques in the recruitment of Kyrgyz citizens for hostilities in Syria. Deputy Dastan Jumabekov said at a parliament meeting on April 17 that "teenagers are being recruited in the Aravan district of the Osh region and being convinced to go to Syria." Supposedly, they are being recruited for fighting in Syria and are transported there via Turkey. A police source in southern Kyrgyzstan told Interfax that a group of men had left to join the fighting in Syria from Kyzyl-Kyya. The young men departed under the pretext of religious education. According to tentative reports, men sent to Syria via Turkey are ethnic Kyrgyz, Uzbeks and Tajiks. 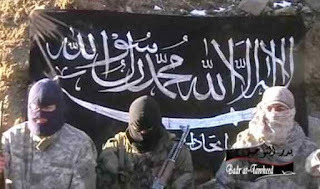 Over 20 young Islamists are believed to have left southern Kyrgyzstan to join the rebel front in Syria. The episode was reported by the Ata-Jurt conservative nationalist party member Dastanbek Dzhumabekov, who on 17 April asked parliament to open an investigation. According to the MP, the youth were recruited in mosques in southern Kyrgyzstan and flown to Syria through Turkey. Mametbek Myrzabaev, an official of the State Committee for Religious Affairs, confirms that last month 7 young people between the ages of eighteen and twenty years left the Batken region in the south of the country. 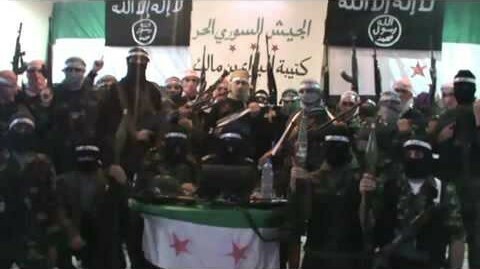 "The money was earmarked for boosting the Turkish Muslim Brotherhood in preparation of a war on Syria." Sherik Karamkhudoev was found guilty on May 10 of founding an organized criminal group, organizing mass disorders, and illegal weapons possession. Ayubob, who had spent time in the North Caucasus, came back with IMU videos and sermons he distributed through his cell phone, authorities said, according to the BBC Farsi-language service. The videos were about the IMU's idea of "jihad," the report said, and IMU videos were also found on his laptop. About 40 defendants in southern Tajikistan have been sentenced to various prison terms in the past three years for IMU membership, the BBC said.